100% made in the USA. Made with 100% real chicken & peanut butter. Wheat, gluten, corn and grain free.Totally Grainless? 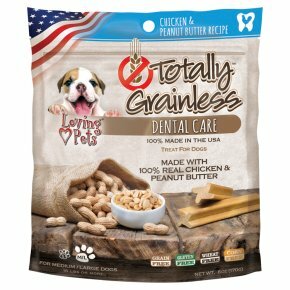 Chicken & Peanut Butter Recipe Dental Care is a healthy, grain-free dental treat made with 100% real chicken combined with peanut butter for a delicious taste dogs love! They use a unique pinwheel shape that helps clean tartar and massage gums better than other dental treats! 100% made in the USA, Totally Grainless has no artificial colours or flavours, wheat, corn, or gluten. Feeding Instructions: For Medium/Large size dogs weighing 16lbs. or more. Provide up to 5 treats/week. These treats are not a replacement for your dog's main meal.